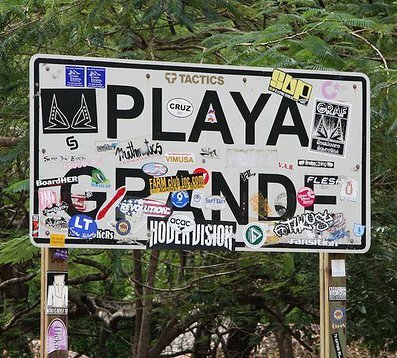 The shuttle company Grayline offers service to Playa Grande twice a day and is a great option instead of driving. If you are driving from San Jose and need directions please email us for directions. Head RIGHT out of the airport. You will start to see the brown signs with the Sea Turtles on them. These signs are for the Marine Park in Playa Grande. You will see a huge stone archway for the town in Philadelphia on your left. Your continue going straight and will be turning Right soon. There is a large gas station on the corner your turning at. When you pass the Super Compro start looking for the gas station for reference. This town is called Belen. Stay straight on this road and it will end into a immedialte 90 degree left hand turn. Go LEFT and stay on the paved street. Your going to pass a lot of turns. Just go straight. You will go up and down some hills and pass the town of Cartajena. Soon after that on the left is a gas station if you need gas. After the gas station you will continue up another hill and will put you in the town of Haucas. Stay straight all the way and you will end up in Mata Palo this is a right outside Playa Grande. In Mata Palo you will see a soccer field and a 4 way stop. GO LEFT towards PLAYA GRANDE. Go straight and you will start seeing the different shops and restaurants in downtown Playa Grande. Please take a LEFT after this sign and continue down the road until it changes to a gravel road. Go straight and follow the sign to Playa Grande Surf Camp.